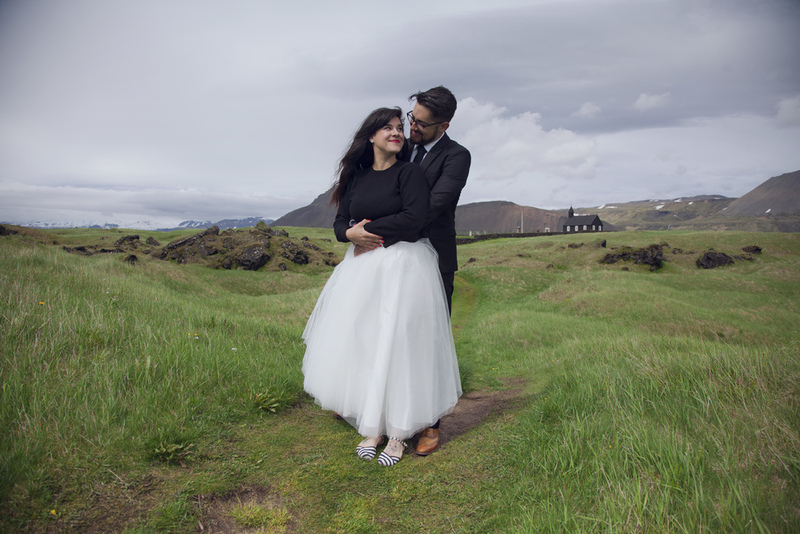 Angie + Reed: The Quietest Wedding in Búðir, Iceland. I had long ago seen a photo somewhere on the internets with a quaint black church nestled in a valley. I'm not at all religious, but something about it drew me in. Through the powers of Google I tracked that church down, and to my delight it was connected to a hotel. When we went to Iceland Airwaves in 2012, that hotel was the first place we booked. In real life, the stark colors were dreamy, the isolation was enticing, and (just like all of Iceland) it looked completely other-worldly. I wanted to elope until my now-hubs reminded me how our mothers might react to it. I never forgot that place, and when we were planning our honeymoon it was, again, the first place we booked. My husband went back and forth with the priest of the church via skype and email in the months leading up to our wedding. He delighted in telling me details of their conversations - like when his kids would be making joyous noises in the background. When we asked him if we needed a license or some kind of paperwork in addition to the wedding certificate we would receive in the US he said this, "Legally you can not both get married in the US and in Iceland. To God - you can say yes to your wife everyday :)"
WHAT A DARLING HE WAS! The day of our ceremony we casually made our way to the lobby, in our black and white wedding digs, to meet one of the most warm and loving faces I have ever encountered, Rev. Páll Ágúst Ólafsson. The ceremony itself was perfect. Entirely more religious than we expected for a predominantly Athiest country, but the Reverend spoke with such soft sincerity it didn't bother us one bit. The Lord's Prayer is positively charming in Icelandic. It was short, and sweet, and truly extraordinary . Just us (and a photographer, duh), in a tiny black church on an island in the middle of the Arctic. I dream of that day still. The day I got to elope on my honeymoon! What could be better? I still can't believe it's us in those photos. Enough yapping- I'll let the photos speak for themselves. All photography by the uncomprable, Rebekka Guðleifsdóttir. Check out Hotel Búðir.